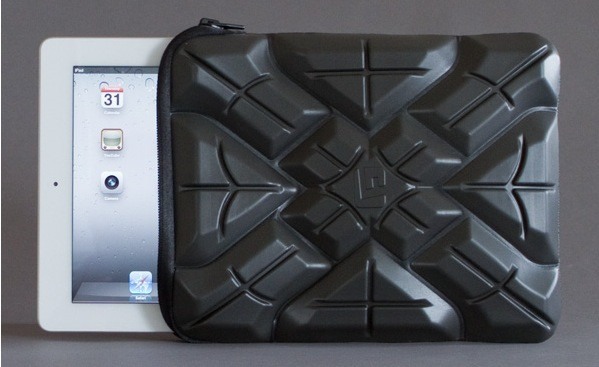 Think you’ll ever be in a situation where your iPad needs to survive a drop from 1/10th of a mile up? Do you ever get so frustrated with your MacBook Pro that you want to toss it out of a two story window, but you don’t want it to actually break? These are ridiculous scenarios and not survivable, right? Wrong. The new high-tech G-Form Extreme Sleeves for iPad and MacBooks do exactly that, and for the skeptics, the creators went about making videos to demonstrate how these cases allow electronics to absorb serious impacts. The first video shows an iPad enclosed in a G-Form Extreme Sleeve being dropped from a light aircraft at 500′ and surviving. The second video shows a MacBook Pro 13″ wrapped in an Extreme Sleeve being thrown off a second story deck. Both survive without incident or damage. I’d say that’s pretty impressive. The videos are fun to watch and a bit sensational but the point is clear, if an iPad can survive a drop from 500′ and a MacBook Pro can get tossed 20′ off a second-story deck, they’ll easily survive a drop from a desk, in a backpack, or what other common fall situation the average person might find themselves in. To make the cases even more durable, they’re water resistant and backed by a lifetime warranty. Interestingly, G-Form’s main products are padding and guards for extreme sports like mountain biking and skateboarding, but somewhere along the line someone had the bright idea of throwing a few elbow guards on an iPad and MacBook Pro and seeing what happened. Good call huh? You can get the iPad G-Form Extreme Sleeve for $59.95 from their website now, and you can pre-order the MacBook Pro sleeve which is due to be released soon. The sleeve for the MacBook comes in a variety of sizes, 11″ for the Air, 13″, and 15″, and ranges in price from $69 to $79.95, and they say if you order the wrong size they’ll ship you the right size for free. Now the next time you hear someone complain about not finding a good case for their Apple gear, tell them to check these out. The same guys made a video of bowling balls being dropped on an iPad and surviving with the Extreme Case. I’m really interested to see some independent reviews of these once they hit the wider marketplace. If they hold up as advertised, I’ll get one for my Air. I wonder if it falls on it’s side though? That’s the most probable drop from a backpack or otherwise. How well does it survive then? If it can stand up to a sideways drop too, it’d be the best case on the market. this was using a prototype version and it was thrown onto it’s corner on concrete and the screen cracked, but if you read the report G-Form is going to alter the cases prior to hitting the mass market so that they have corner protection. That video shows off the cases only weakness, I hope they do something about the corners and side protection. Kind of impressive. They guys who designed the sleeve are pretty clever. I am just a little curious why it is called G-form. 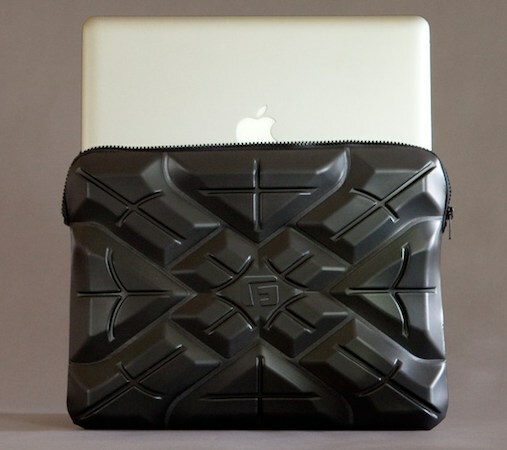 G-force + Form fitting Macbook sleeve = G-Form?